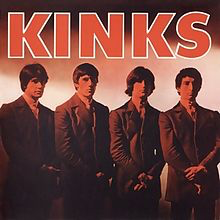 The Kinks’ debut album, released in 1964, contained none of the pertinent “social comment” songs that the group, through the songs of Ray Davies, became known for - “Waterloo Sunset”, “Sunny Afternoon”, “Tired Of Waiting” and so on. This was an album similar to those put out by The Rolling Stones, Manfred Mann and The Yardbirds at the time, The Who, and to a certain extent The Beatles (although The Kinks, like The Stones and The Yadbirds, were blues to The Beatles’ rock n roll). The material is short, sharp blues rock covers, like Chuck Berry’s “Too Much Monkey Business” and “Beautiful Delilah” (also covered live by The Rolling Stones) and the much-covered “Long Tall Shorty”. Slim Harpo’s “Got Love If You Want It” is also from the same supply. Other songs, like those written by Shel Talmy and Davies himself were pastiches of that blues rock style (particularly “I Took My Baby Home”) and, while it is all quite fun and enjoyable, it is very much just another mid 60s British blues rock album. At the time it was perceived very much as “second rate Rolling Stones”. The Kinks desperately needed to find their own identity. Thankfully for them they were soon to do that. Two Davies tracks give a hint as to the potential that lay relatively dormant at this point - “Stop Your Sobbing” (a hit for The Pretenders some 14 years later) and the now viewed as ground-breaking rock riffery of “You Really Got Me”, full of (at the time) unique lead guitar attack. That track really stands out from those around it as something different and, yes, something special. The subsequent single “All Day And All Of The Night” would cement that new reputation even more. The Kinks were to prove that they were not just another British r ’n’ b band. The “Live At The BBC” extras included in the “Deluxe Edition” are excellent, both in musical and sound qualities.